The F clef is one of the most common clefs in music. It’s used in in all styles, from pop/rock to jazz, classical, film scoring, and everything in between. It’s especially important for anyone desiring to play bass, piano, cello, or low woodwinds and brass, as well as those interested in arranging or composing music. Compared to treble clef, the F clef is normally used for lower-sounding instruments. In the previous two lessons, we focused on treble clef. Now that we understand how clefs work, we’ll find it much easier to learn new ones. The mechanics and understanding are exactly the same. The only things that are different are the placement of the notes in relation to the staff (as well as the specific design of each symbol). Let’s take a closer look at the F clef. Just like G clef, the F clef’s design centers around the note it’s named after. In this case, it’s the note F, specifically the note F3. The design of the clef starts out with a small filled-in circle drawn clockwise, then it swings outward and curves around the top, and comes down the right side following a similar curve, finally ending a little to the left of where it began. Two dots are added to the right of the clef. The F clef is generally found in only one position nowadays, known as bass clef. 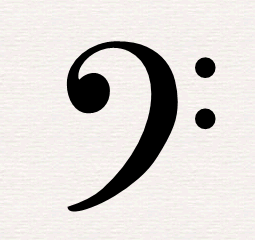 For this reason, the terms F clef and bass clef are often used interchangeably. But to be more precise, the bass clef is actually a specific position of an F clef (just like treble and g clef). Bass clef is very common, second only to the treble clef which we already covered. Here’s a list of common instruments that use bass clef as their main clef: bass guitar, cello, double bass (upright bass), bassoon, trombone, and tuba. It’s also used in vocal music, including baritone, bass, and sometimes tenor voices (all of which are various types of male voices). 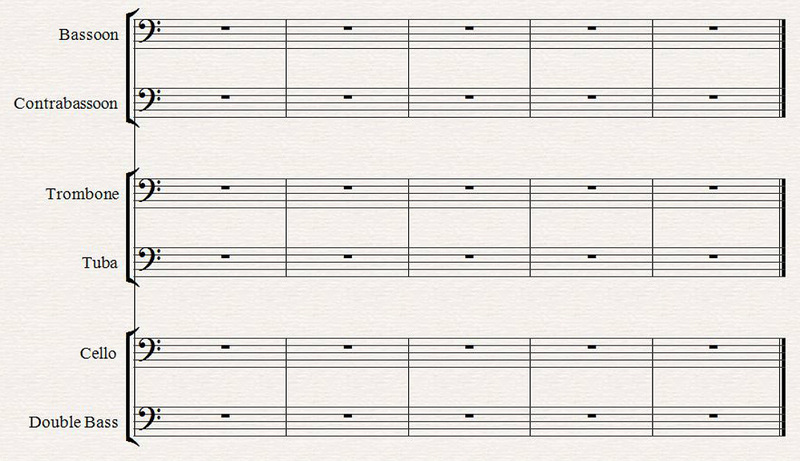 Music for unpitched percussion (like drums) sometimes uses bass clef, even though the lines and spaces don’t represent pitches but rather specific sounds. This is an alternative to using a special percussion clef. There are a couple other positions for F clef, but they’re no longer in common use nowadays. They’re worth learning about, though, just in case you happen to come across them. The first one we’ll take a look at is the baritone clef. This clef has a bit of higher range than bass clef, and was often used for baritone voices (a male voice-type whose range is between tenor and bass). It was also sometimes used for keyboard parts. Nowadays, bass clef is normally used instead. The sub-bass clef, or contrabass clef, is the lowest clef known to man. 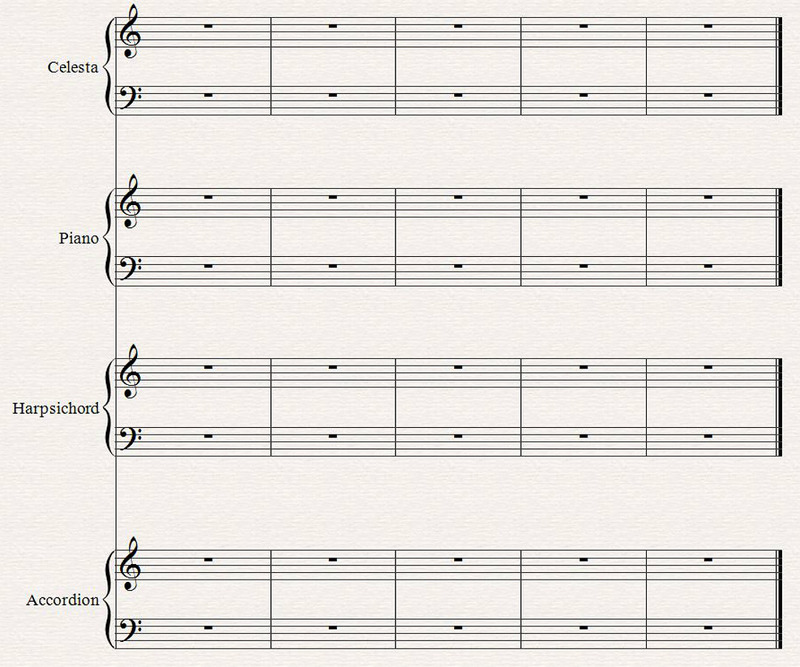 It was sometimes used to write low bass parts in order to avoid lots of ledger lines. What’s the name for an F clef that is positioned so its two dots surround the 2nd-highest line on the staff? Where is C4 (middle C) located on the bass clef? Which statement is NOT true about the bass clef? The baritone clef is an F clef positioned with its dots surrounding which line of the staff? The sub-bass clef is an F clef positioned with its dots surrounding which line of the staff?